My name is Becca Moore. I will be interning with PHPG this summer (from mid-may to early August) in Granada. Less than 2 months until I'm in Nicaragua! I am in my second year of graduate school at the LBJ School of Public Affairs at the University of Texas at Austin. I will be graduating with a masters in Global Policy Studies with a concentration in International Development in December. I'm really excited to get out of the classroom and put my education to the test. After graduating, I was itching to travel again, so I went to Thailand to teach English. I absolutely loved Thailand. 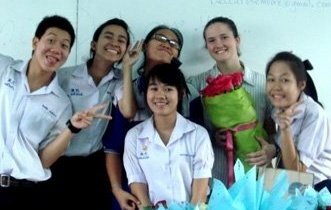 I taught English at a high school in Lampang (a city in the north). I taught about 24 classes a week and had over 800 students! It was a bit overwhelming, but an amazing experience. While I was in Asia, I was able to visit China, Laos, Cambodia, and Nepal. In Nepal, I volunteered for a month at an NGO called Environment and Public Health Organization, working on designing decentralized wastewater treatment plants on the Bagmati River in Kathmandu. It was there that I knew that I wanted to work in the International Development field. Volunteering in Nepal led me to grad school in Austin and eventually this internship with PHPG. I'm really excited to be working with PHPG this summer!